Forgive me if I missed it but I did do a search but came up empty handed. 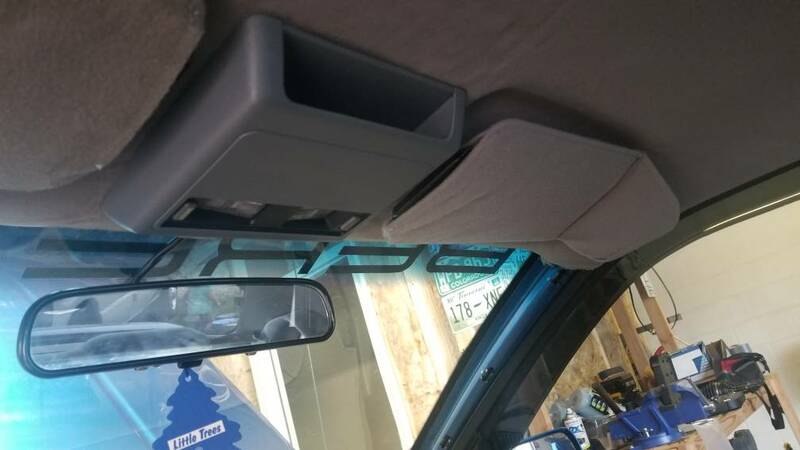 Has anyone installed an overhead console in their car that didn't come with one originally? I'd like to install one in my '93 GTZ but have no idea what's involved. Anyone? Re: Adding the overhead console? I never swapped one onto a car, but I remember some of it from parting a yellow Indy a long time ago. There is the metal bracket behind it that you will need. Wiring I believe its a constant 12 volts and the grounds are what get switched for the ceiling/reading lights (That is how my Z26 mirror is), power/ground can be picked up from the existing dome light. I believe it is all held on with 4 screws/bolts, two fillips for the console (Similar screws to what holds the side interior trim on when you open the door, the long plastic on the floor between the carpet and door jam rubber) and two 7mm hex screws for the bracket (These were shorter). They all go into the metal brace section between the metal roof and the windshield, they threaded right into the metal. A hole will need to be cut into the roof insulation/shell. I do not remember if the roof itself was actually different in any way. I added it to mine. Let me find some pics. Is that a self dimming mirror? Yeah, self dimming, temp and compass. Has no map lights, so that's why I added the console. Well, the bracket itself wasn't too bad to install. The original ground for the rear view mirror map lights located one of the holes to get it started. It did require a bit if cutting to the headliner... and of course, my 25 year old headliner adhesive decided to fail all over the place when I touched it... lol. Hopefully some Super 77 will do the trick overnight. As for the wiring - The ground is pretty obvious but it also appears there are two +12v wires going to each bulb. I assume one is for a switch and the other is to activate the bulb for courtesy lights when the door is opened? I gave it +12v to test it and the switched side worked but when +12v was applied to the other, the bulbs lit up very dim. I tried my LED festoons and they worked great aside from being clocked 90* the wrong way and they wouldn't activate at all using the courtesy wire... Not sure what to make of the courtesy wire... any thoughts? Forget some reason these LED festoons (tested fine) don't seem to work but the Incandescents do. As I understand it, the black and white wires are grounds (switched) and the orange is constant +12volts. Ideas? DanteGTZ wrote: my 25 year old headliner adhesive decided to fail all over the place when I touched it... lol. Hopefully some Super 77 will do the trick overnight. Oh, no, no, no! Super 77 is not good for headliners (specifically states on the can it isn't for headliners, or used to), use actual headliner adhesive. I think it is the high temperatures headliners are subjected to that the Super 77 can't handle... If you've already done it though, I hope it works. For the electrical, black to ground, white is ALSO a ground -it grounds at the door-pins when the doors are opened, orange is hot at all times (fused). The switches just change which ground the sockets get -always grounded or only with a door open. The LEDs should work, unless the polarity is wrong (switch them around), but otherwise I can't guess why else they aren't working. A super 77 help just fine. It really didn't fall everywhere, I just needed to tighten the headliner up where I had to make my cuts for the console. The console suspends the areas of the headliner that had to be trimmed. In any case, it's very likely that I'm going to need to replace my headliner sometime soon anyway. Although it isn't falling, the foam underneath the fabric is broken down so badly that whenever you touch the headliner at all, it makes a permanent dimple in the foam. All in all I'm happy. The console will make a great spot to clip my radio @ Bfest next year. Orange wire: Always +12 volts. 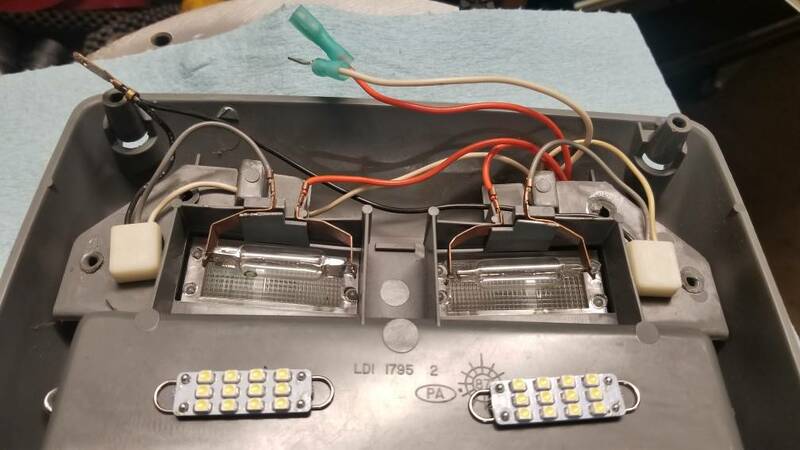 Can use dome light positive for this, Connect LED Positive sides to orange wire. White Wire: Interior lights, switched ground (Door switches), Can use dome light negative for this. Black Wire: Always Ground, connect to battery negative (or Car Body). I think I'm a little late, but I hope this is helpful.